Joten Okamoto (NAOJ Fellow) and Takashi Sakurai (Professor Emeritus of NAOJ) were analyzing data taken by the Solar Optical Telescope onboard HINODE, when they noticed the signature of strongly magnetized iron atoms in a sunspot. Surprisingly the data indicated a magnetic field strength of 6,250 gauss. This is more than double the 3,000 gauss field found around most sunspots. Previously, magnetic fields this strong on the Sun had only been inferred indirectly. More surprisingly, the strongest field was not in the dark part of the umbra, as would be expected, but was actually located at a bright region between two umbrae. HINODE continuously tracked the same sunspot with high spatial resolution for several days. This is impossible for ground-based telescopes because the Earth's rotation causes the Sun to set and night to fall on the observatories. These continuous data showed that the strong field was always located at the boundary between the bright region and the umbra, and that the horizontal gas flows along the direction of the magnetic fields over the bright region turned down into the Sun when they reached the strong-field area. This indicates that the bright region with the strong field is a penumbra belonging to the southern umbra (S-pole). The horizontal gas flows from the southern umbra compressed the fields near the other umbra (N-pole) and enhanced the field strength to more than 6,000 gauss. Okamoto explains, "HINODE's continuous high-resolution data allowed us to analyze the sunspots in detail to investigate the distribution and time evolution of the strong magnetic field and also the surrounding environment. Finally, the longtime mystery of the formation mechanism of a stronger field outside an umbra than in the umbra, has been solved." 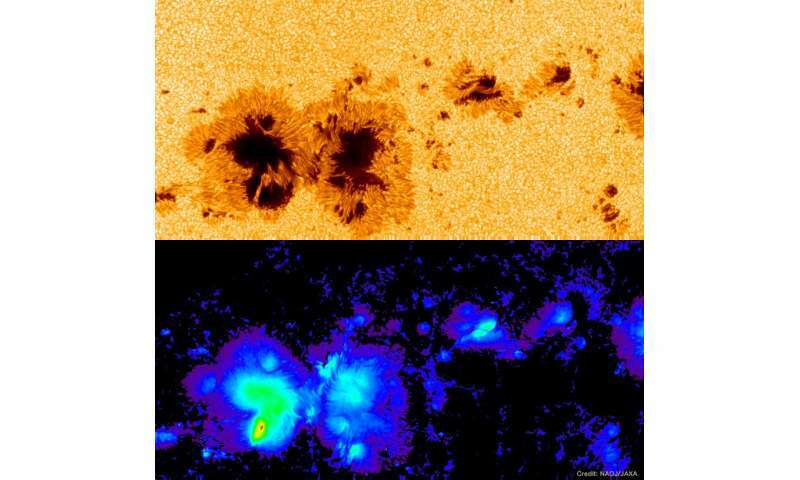 record breaking magnetic field, the astronomers determined that it was generated as a result of gas outflow from one sunspot pushing against another sunspot. horizontal gas flows from the southern umbra compressed the fields near the other umbra (N-pole) and enhanced the field strength to more than 6,000 gauss. They STILL call it 'gas' flows, but it's actually PLASMA flows (FOURTH STATE OF MATTER, ie: 'solid', 'liquid', 'gas', then 'plasma'). Mate, this new year, try to listen/read/understand, instead of ego-tripping and indiscriminately/maliciously insulting posters when they are correct and you entirely incorrect. Try. Thanks. It also has further info from mainstream article/work that vindicates what certain posters have been pointing out for your gang's benefit while you ridiculed/gang attacked the messengers instead of listening/thinking properly. PPPS @The gang: it's well passed time all here ceased 'old personal feuds' and started politely/objectively discoursing/thinking. Yes? The point was that Science Journalists perpetuating misleading LABEL which distracts from the actual MATTER (plasma) flows which that Paper NOW ADMITS CAUSE mag-field RE-arrangements (not 'disconnections, reconnections).